New facts continue to emerge from the press conferences of Kent Wells and Admiral Allen in regard to the current state of the killing of the Deepwater Horizon well. Admiral Allen held the first and shorter conference on Friday, and there were only two external questions, so perhaps interest is now fading fast as the well is now effectively plugged. It is not yet legally plugged and the need for certain procedures to comply with regulation was part of the discussion today. Admiral Allen noted that after injecting the well with cement, a separating fluid was injected and then the cement pumped down to the bottom of the hole by injecting mud behind the separating fluid. He again spoke to the finding that the cement had only gone down the production casing, and not the annulus. 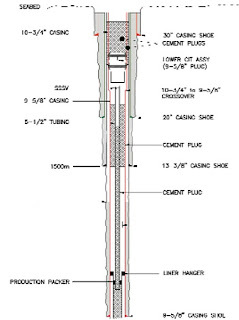 As I’ve told you in previous briefings, we’re starting about 4-1/2 feet away from the well horizontally, and we’ll drill down at a very, very slight angle. If for some reason they penetrate the annulus in the process of doing that, they’ll prepare – they'll be prepared to go ahead and assess the condition of the annulus at that point and go ahead and submit the well in. The sense of those comments is that if the cement followed the oil path and sealed it, then there wasn’t a leak in the annulus, since all the cement went down through the casing. Thus he likely is now expecting that when the relief well intersects the annulus and the cement within it, it is not going to find any hydrocarbons. (These will be detected in the returns of the mud to the surface as they continue to circulate fluid through the drill bit on the relief well). It is going to take another week or so to reach and penetrate the annulus and assess its condition, but after that the finale will come quickly. Kent Wells noted that the relief well has drilled beyond the last set of casing, that was just set, for an additional 15 ft, and this has given them the space to run the cement bond log and the first ranging run to ensure the positions of the wells remain as desired. The next drilling run (of about 30 ft) will likely take place on Sunday, and he too felt that the intersection would be in the August 13-15th time frame. 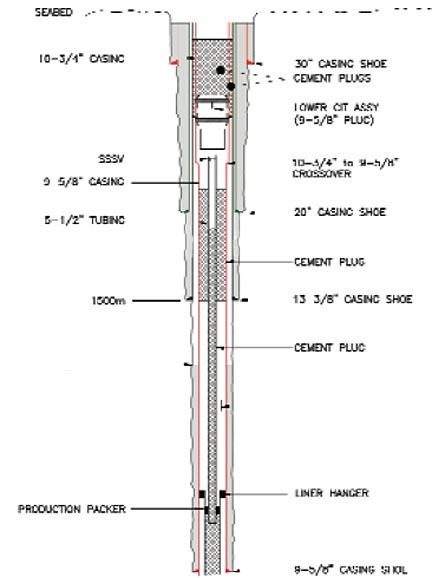 (Incidentally the finding that the leak was from the cement in the shoe of the well, and not in the annulus could well mean that the cement bond log test, even if run, would not have found the original leak in the Deepwater well, since it was below the range over which the instrument would run - as the need to drill out the cement in the relief well before running it illustrates. Similarly the discussion about the number of centering pieces on the production casing may also no longer be pertinent to the failure). However, if the oil flow was constrained only through the center of the production casing, then there should be no hydrocarbon in the annulus, and to verify that they may, perhaps drill longer and further down the annulus than otherwise planned. (This to get down to the area of the shoe to ensure that the cement job already completed has sealed off any possible paths upwards outside the casing). In response to a question, Kent Wells stated that BP had pumped 500 barrels of cement down the well, and of this roughly 200 barrels went into the formation, with 300 barrels left in the casing. Side view showing the removed top part of the casing and the two cement plugs required to seal the well below the seabed. "Similarly the discussion about the number of centering pieces on the production casing may also no longer be pertinent to the failure"
Not sure about that. Maybe the problem was indeed no seal at the casing shoe. But the casing shoe was set BELOW the hydrocarbon-bearing formation. Reservoir fluids would still have had to travel down through the supposedly cement-filled annulus to the casing shoe, and then enter the casing to go up. Fluid flow either up the annulus or down, round, and up the casing would have had to flow through an annulus which should have been totally blocked with cement. Obviously, the annulus was not blocked. Also, if BP had run that cement bond log (instead of cancelling it to save time/money), they would have expected physically to tag the top of cement inside the casing at a depth a little above the casing shoe. If the theory that the blowout was down, round, up is correct, then there would have been no cement in the casing -- which the maximum depth achieved with the logging tool would have shown. BP's time/cost shaving decisions to omit the logging and the required centralizers are still in the cross-hairs -- along with all BP's other time/cost shaving decisions which caused this blowout and the deaths of 11 human beings. But let's give credit where it is due. Departing CEO Tony Hayward bears a huge moral burden for creating an environment where BP took unnecessary gambles to meet his financial targets; but the engineers in BP have proved in killing the blowout that they are a very capable lot -- given good leadership.